Wild was a book that had been on my tbr pile for a while, so when I heard that the author was coming to our local Lit Fest, this seemed the perfect time to pick it up and read it. I don't know quite what I was expecting, but it was not a memoir about hiking for three months across gruelling terrain with a huge backpack attached. 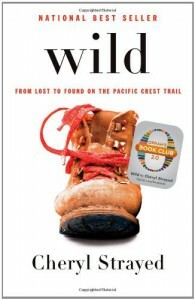 However, such was the crazy adventure that Cheryl Strayed tackled back in 1995, before the days of internet or mobile phones. Having done minimal research, she had very little idea of what to expect and her guide book for the trail became her bible. The agonies of the journey were lurid - boots that were too small, causing extreme damage to her feet; blistering, bruising and loss of toe-nails, as well as abrasions on her hips and shoulders from the weighty backpack that she dubbed Monster. But to her credit, she stumbled on, mile after mile, through extremes of temperature and weather, up and down mountains thousands of feet high. Her daily mileage increased from an initial, slow, eight miles per day, to a blistering nineteen as her fitness increased. Unfortunately for the reader, she wrote the account quite a number of years after completing the hike and the book felt like it had lost its immediacy. I trudged along with her, but there wasn't much in the way of excitement or detail and the scenery was not in my head like the sore feet were. The death of her mother at just 45 was the trigger for the journey and by the end of it, it appeared that she had achieved her objective of putting her demons to rest. Although hiking would not be my solution to such problems, it worked for Ms Strayed, and that was what mattered.